The very first European Heart Valve Disease Awareness Day was celebrated across Europe on the 8th September. We held our UK event at the London ExCel Centre as part of the lead up to PCR London Valves, world's largest educational meeting dedicated to the field of valvular heart disease. The day began with a CPD approved webinar for primary care professionals hosted by Dr Chris Arden, GPSI Cardiology, Southampton and Editor for PCCJ. The webinar focused on the role of primary care in the detection heart valve disease and the patient pathway. Based around our Practical Guide for Primary Care the webinar provided a platform for education and discussion amongst primary care professionals. Later the awareness day event saw 70 guests attend including patients, their family members, clinicians and supporters of Heart Valve Voice. The attendees heard talks from clinicians who all specialise in heart valve disease care covering topics such as the history of heart valve disease, its prevalence, treatment options, access to treatment and the importance of the patient voice. We also heard from two of our patient ambassadors, Pat Khan and Marina McGrath who shared their experience with valve disease and how they have been exemplifying the power of positive ageing since their treatment. Guests were given plenty of opportunity to mingle with one another allowing for interesting discussions between patients and clinicians. In addition to the presentations, Heart Valve Voice took the opportunity to introduce two of our new patient resources. The first resource we presented was our children’s book that is aimed at helping kids and grandkids have a better understanding of what their loved ones are going through. The book, written by the great-grandchild of a valve disease patient and our CEO’s son, explains the patient pathway through the eyes of a child and is a great resources that parents and grandparents can share with the children in their lives. We were lucky to have the book’s illustrator, Sally Brown on hand at the event to sign copies and talk to guests about the process of putting the book together. The second resource that we introduced was our new Augmented Reality Cath Lab Experience. Patients who are put forward for a TAVI (Transcatheter Aortic Valve Intervention) treatment and will find themselves receiving their treatment in a Heart Centre’s Cath Lab. To help these patients prepare, the programme, which is viewable on a smart phone or tablet give patients a 3D experience of what a Cath Lab looks like including the clinicians found in the room, the equipment, videos explaining the procedure, and fellow TAVI patient stories. Following the success of the awareness day, Wil Woan, our CEO then went onto present at PCR London Valves and spoke to the delegates about the day and the importance of raising awareness of heart valve disease not only across the UK but also across Europe. Our partner organisations also hosted events to celebrate the European Heart Valve Disease Awareness Day. Events included; a Gymkhana event in Madrid hosted by Aeopvac that invited members of the public to participate in activities and try out their heart valve disease knowledge, A media tour across Paris hosted by Alliance du Coeur that saw their media bus touring around the city and stopping at various media outlets to spread the word about valve disease awareness, A summit meeting in The Netherlands where they introduced the European Heart Valve Disease Partnership Manifesto to local politicians and clinicians and a flash mob run and parliamentary meeting in Milan hosted by Cuore Italia. Wil Woan and UK patient Mike Addleman joined in the festivities in Milan and even ran the flash mob run with Mike showing how patients can accomplish great things after heart valve disease treatment! 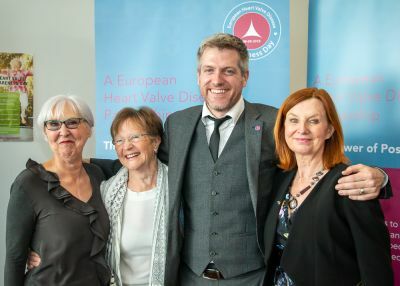 All in all the first ever European Heart Valve Disease Awareness Day events were a great success and we’re all looking forward to celebrating again next year!